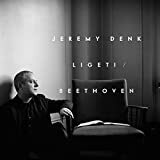 Jeremy Denk is a thinking person's pianist, at his best putting together quirky playlists or drawing out bizarre sides of pieces you thought you knew. He is a musician of equal parts wit and enthusiasm, and this is probably why reading his thoughts about music is just as good as hearing him play it, if not better. In his last few appearances in the area, solo recitals in 2012 and 2013 and with the National Symphony Orchestra, he has disappointed a bit in the hearing. I suspect that for listeners who focus, even unintentionally, on his manner at the keyboard -- his gyrations and especially his tendency to turn towards the audience so that his face communicates an expression mid-phrase -- the humor and analysis of the music come through visually. Having spent most of his latest recital, presented by Washington Performing Arts at the Kennedy Center Terrace Theater on Sunday afternoon, looking at the floor instead of at him, I received only the sounds he made, including the loud slams of his percussive left foot. 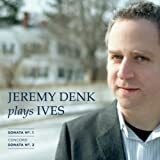 Curiously, Denk took the same over-delicate approach to Scott Joplin's Sunflower Slow Drag, co-written with Scott Hayden, echoed in the later work that was the closest to it, William Bolcom's Graceful Ghost Rag, played even more sotto voce. This was not at all the sound of the rag imitated by Stravinsky in his Piano Rag Music, a jagged jangle of clashes and metric complexity, nor the "Ragtime" movement in Hindemith's 1922 Suite, which was on the vicious side. Both pieces date from before their composers immigrated to the United States, and both came to a more nuanced understanding of jazz after living here. William Byrd's ninth pavan (The Passinge Mesures), from My Ladye Nevelles Booke, and Conlon Nancarrow's first Canon for Ursula had only a tangential relationship to ragtime music, in that they had different kinds of rhythmic complexity. Denk likewise seemed to include Constant Donald Lambert's stride piano send-up of the Pilgrim's Chorus from Wagner's Tannhäuser mostly for laughs. With Haydn's C Major Fantasia (Hob. XVII:4), Denk was back to his fast and furious Bach mode, with many of the details glossed over at an ultra-fast tempo. (It is marked Presto, to be fair.) This piece comes to a complete stop on a low octave a couple of times, with a fermata meant to be held for a long time followed by a move up a half-step, and Denk played with those moments quite gleefully. The frenetic and excessive side of Denk's musical personality was suited to the final work, Schumann's Carnaval, with its mood changes from madcap to distracted to delicate and back again. One had the sense of a somewhat unbalanced person flitting manically from one thought to another, which is at least part of what Schumann wanted to get across. The only disappointment was that Denk did not play something for the "Sphinxes" movement. It is not really a movement, just the work's three letter-based themes (referring to Schumann and the birthplace of his one-time fiancée, Ernestine von Fricken) written in long notes, but I had hoped that Denk might do something unexpected with them. Instead, as with so many performances, the puzzles of the sphinx were left unposed, probably what Schumann intended, but not what one expects from someone like Denk. Washington Performing Arts's Hayes Piano Series continues this Saturday, with a recital by pianist Herbert Schuch (October 17, 2 pm). That should be Donald Lambert on stride piano Wagner, not Constant Lambert. Indeed. Correction noted. Thank you!